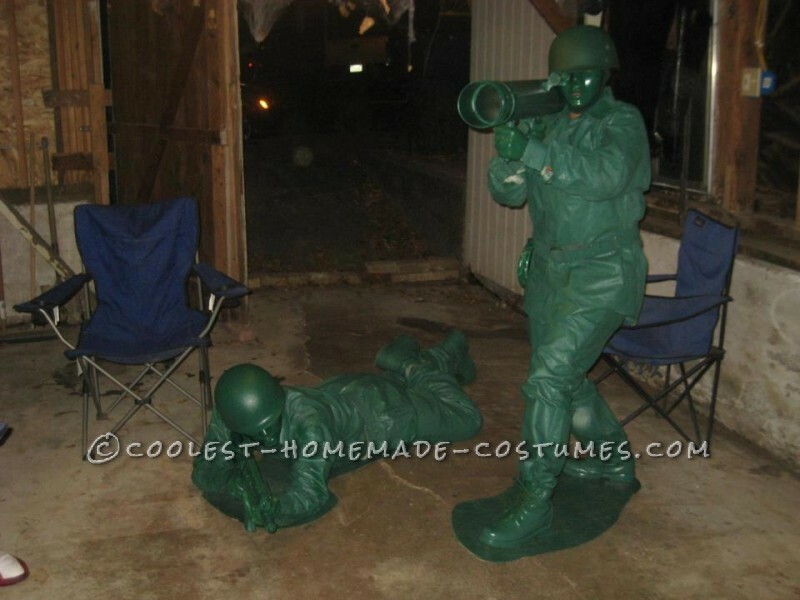 I talked my husband into being a plastic green army man for Halloween with me. I told him that I’d take care of making it and he wouldn’t have to worry about it. So I went through a lot of trial and error. 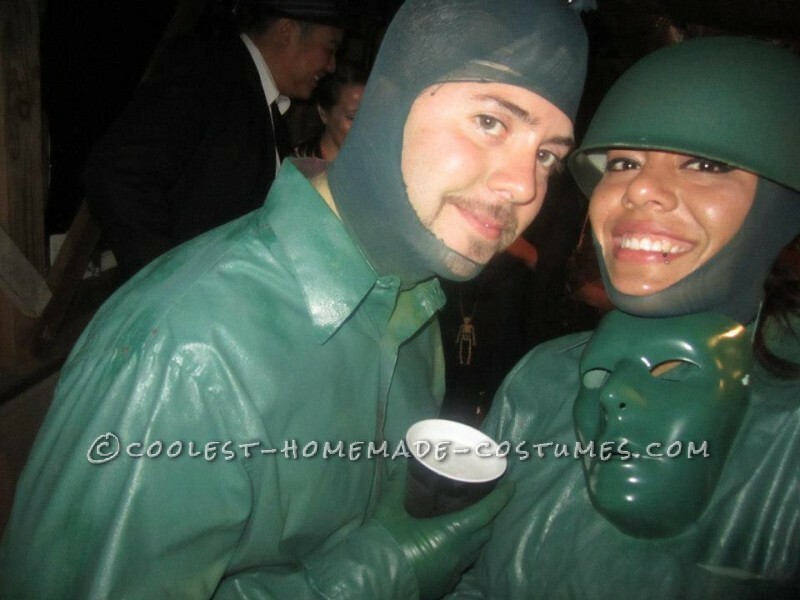 First Attempt: I bought rain suits from Home Depot to get the plasticky look. I thought that spray painting them would work but it turns out, and I should have known, that the paint never dried. I had to throw them all away. Second Attempt: I bought different material rain suits. This time, the spray paint dried but it cracked immediately leaving me with many spots. Third Attempt: Decided to keep those same rain suits since the paint dried and bought different type of paint, so I bought latex paint from Hope Depot. As you can already guess, it also did not work. After the third attempt I decided that I was not going to give up! I’ve worked way too hard already though nothing had worked yet. Fourth and Final attempt: I used my husband’s old jeans and a dress shirt and painted them with two coats of the latex paint. IT WORKED! Worked even better than what I expected. This method gave my outfit that plasticky look I was looking for. I went to Goodwill and bought some work boots for $10. 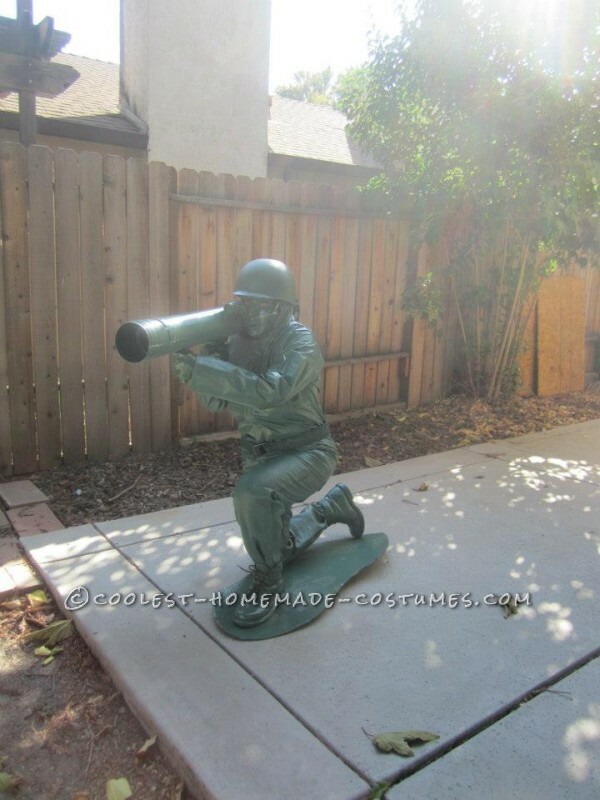 Used dish gloves and painted them green, bought helmets and masks from the Halloween store, bought some pipes and other material to make my own bazooka and found the perfect toy gun at Walmart. We made water jugs out of tambourines and aluminum foil and grenades out of plastic Christmas ornaments. And made the platforms out of cardboard. Then I went to town painting everything the same color. This was our end result! Our experience wearing these costumes was so much fun! 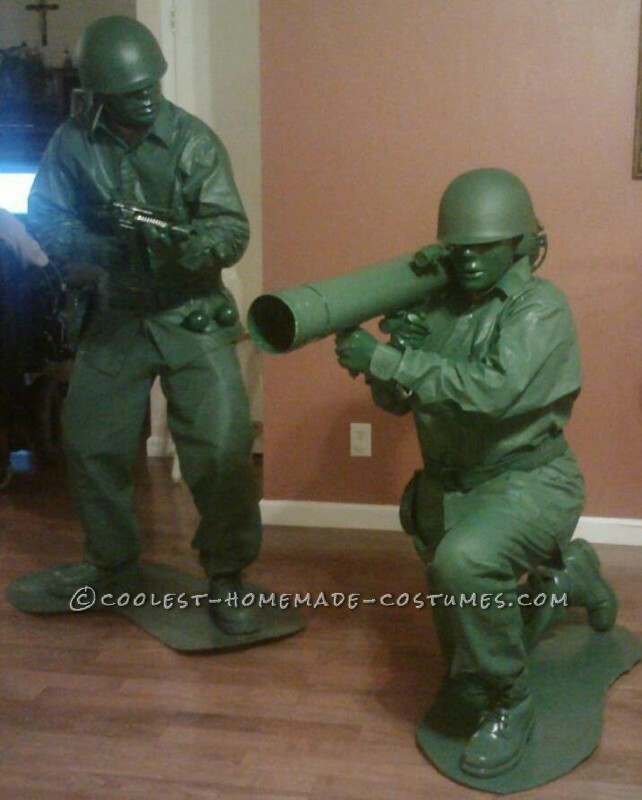 I posted my picture on Facebook and people seriously thought that we were life size plastic soldiers. Then they realized that it was actual people. We got a lot of great compliments which made Halloween even better!